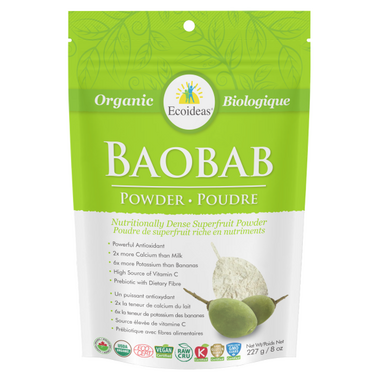 Baobab can be used as an exciting new ingredient in yogurt, milk, bread, bars, jams, cookies, muesli, drinks, fruit juices, chocolate, ice cream, and likely more creative concoctions. Excellent product. Love this product is so high in vitamins minerals etc. High fiver and vitamin C great in smoothies and sprinkled on other foods to trick my family into eating more healthy. It's very good in my smoothies, I take it for the benefits it brings. Adds a nice touch of fiber to my diet. Baobab was likely a staple for much of human history and it is getting back to roots to add a little each day as fiber intake in North America is well below what it has been for most of our ancestors. don't like to swallow pills, not even vitamin pills, so this powder goes into my morning cereal(Hot or cold) and tastes quite nice, actually. prefer it to singular pills anytime! First time with this product. Used it only twice so far. I don't know yet how good it is for my body but what I can say is that I very much like the taste, fruity and sweet, light orange in color. It does not dissolve well in cold water but it does make a nice simple and tasty beverage. It's best to use a blender for mixing without lumps.